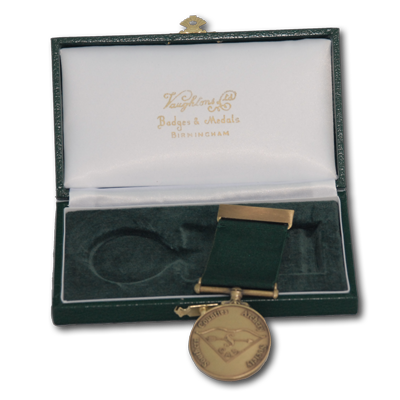 Bronze medallion hung on a green ribbon, in a padded presentation box. Kent County Target Archery Champion - Senior Lady, Recurve Freestyle. Open only to senior ladies, shooting the Hereford round with the recurve freestyle bow. Donated by the Southern Counties Archery Society (SCAS); the current medal replaces an earlier edition, which had become a little shabby with age. Open only to senior ladies, shooting the Hereford round with the recurve bow.